The mystery surrounding a long-questioned and allegedly "fixed" non-partisan 2006 Regional Transportation Authority (RTA) bond election in Pima County, AZ continues to deepen as troubling new details have now emerged. The resolution in this matter --- should it ever come --- could spell trouble for supporters of paper-based optical-scan electronic voting systems, since indications are that if the election was rigged, it was done with insiders via the electronic central tabulating computers. Late last week another new twist was discovered in the years-long election fraud investigation by Democratic and Libertarian Election Integrity advocates in Tucson. The revelations come to light in what was thought by many to have been a settled election, at last, following a long-sought hand-count of paper ballots carried out last year by the office of AZ's Democratic Attorney General Terry Goddard. The AG had announced in April of last year that his criminal investigation hand-count had "affirmed" the original results of the election were correct. As it turns out, The BRAD BLOG, which has been covering this bizarre matter for years, plays a small role in this latest development, as a promise that Goddard's office made to us last year concerning the "poll tapes" --- remarks which he was asked about during a press conference at the end of the hand count [see the remarks on video below] --- may have now boomeranged on him. Given that Goddard is now the likely Democratic nominee to face Republican Gov. Jan Brewer in this fall's Gubernatorial race, this revelation couldn't have come at a much worse time for him. After many years of litigation, Election Integrity advocates have now finally been allowed to review the long sought-after poll tapes in question. What they've discovered is disturbing and, so far, without legitimate explanation. Out of 368 precincts, 112 poll tapes are completely missing. Moreover, 102 of the "yellow sheets" --- certified precinct reports, signed by poll workers, detailing corresponding summary information, such as numbers of ballots received, cast and spoiled, as helpful for important auditing functions at the precinct level --- are missing as well. Without getting into too many of the weeds --- and there have been many along the way --- the RTA bond measure, or ones like it, had been on the ballot several times in Pima, and had always been defeated. In 2006, however, the initiative was said to have finally passed. Ironically, at least in hindsight, the Democratic Party had actually supported the measure at the time in order to help see new roads built in the Tucson area. 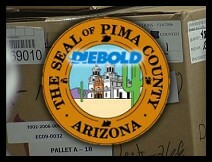 The election was run in Pima County (Tucson) on Diebold's paper-ballot based optical-scan machines, the same ones seen being hacked in HBO's Emmy-nominated 2006 documentary Hacking Democracy (video of that hack here). Election Integrity advocates from AUDIT-AZ (Americans United for Democracy, Integrity and Transparency in Elections - Arizona) and BlackBoxVoting.org became suspicious about the election results after the measure had passed, and set about investigating various red flags in the contest. Along the way, with Risner representing the county's Democratic Party, they were successful in securing the landmark release of Diebold's so-called "proprietary" databases from the race. The databases purport to show how votes were recorded and who may have accessed electronic tabulators at various times. In the course of that victory, it was discovered that county election officials had been printing out results of the race prior to Election Day, in violation of state law, and were perhaps even manipulating the databases themselves. For years, Goddard refused repeated requests by the Democrats to hand-count the paper ballots from the election to assure the machine reported results were correct. The ballots had been held for some time by the Pima County Elections Division, and then in a supposedly secure, deep storage facility run by the Iron Mountain firm. As the controversy roiled, and an official investigation by the AG found various concerns in the race, in the machines and with the county's security procedures, a former county official filed a startling affidavit in July of 2008. He alleged that he'd been told by Pima County Elections Division programmer Bryan Crane that he had "fixed" the RTA election "on the instructions of his bosses." Even after the county whistleblower had come forward to allege he'd been told the election was "fixed" on the instructions of election officials, Goddard still refused the Democrats' newly re-iterated pleas to hand-count the paper ballots to determine whether the results, as reported by the potentially-manipulated electronic central tabulator, matched the hand-marked paper ballots as voted on Election Day in 2006. Given that they had no way to hand-count the ballots on their own (only AG Goddard had the legal authority to call for a hand-count as part of a criminal investigation by that time), and that a judge had ordered the ballots --- long held at Iron Mountain pending the litigation --- could soon be destroyed, Risner filed a motion in court [PDF] requesting to review the "poll tapes and yellow sheets", supposedly stored inside the boxes along with their corresponding paper ballots at the storage facility. The poll tapes are paper records printed by the precinct-based optical-scan machines at the close of polls, showing exactly what was scanned and what the results of that scan were before those numbers are sent to the central Diebold tabulator at county election headquarters. 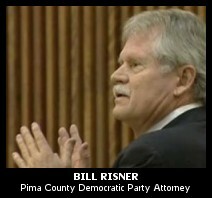 In February 2009, within days of the legal attempts to gain access to the poll tapes, and without notifying the Democrats who'd requested them, Goddard suddenly removed all of the ballots and poll tapes stored in the boxes with them in Tucson, and whisked them up to Maricopa County (Phoenix) after, he says, he suddenly determined that a criminal investigation merited a complete hand-count of the ballots. 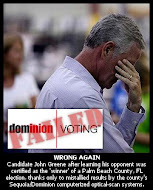 As the Arizona Daily Star reported on February 13th, Goddard said there was no basis for him to hand-count the ballots. State law, he said, doesn't allow for hand-counts simply out of "curiosity". On February 18th, attorney Risner informed Goddard in a letter [PDF] of the party's attempt to examine the poll tapes. And on February 23rd, Goddard's office suddenly announces they'd received a "secret court order", to remove the ballots from Pima to examine them in Maricopa. "There were suspicions that went in all one direction that could not be explained," Goddard would later tell the media after the hand-count had been completed in April. "There wasn't a credible explanation for all of the different coincidences that seemed to have happened on this particular election." Though Goddard's office had claimed the counting would be done publicly, observation was strictly limited to just a few observers from the various political parties who had to be specifically approved by the AG. As the count proceeded, the AG's Press Secretary, Anne Titus Hilby, told The BRAD BLOG directly that the poll tapes would be examined as part of their investigative hand-count. The Election Integrity advocates wanted them examined to make certain that the ballots themselves --- which had been stored at various times at both the Pima County Elections Division (with the "Suspects", as Risner has described them) as well as at the Iron Mountain facility --- hadn't been manipulated and that they matched the poll tapes as printed on Election Day. "Do we plan to examine those?" Hilby responded directly to our questioning by phone, "Yes, we're examining all of the evidence seized, including the poll tapes." That, however, would not be the case. At his press conference following the count, announcing that the hand-count had affirmed the original tally (with a few exceptions he believed to be minor), he was asked about the promise his office had made to The BRAD BLOG to examine the poll tapes. As seen in the short video below, compiled by filmmaker J.T. Waldron, who has documented the years-long fight in Pima County in the recently-released documentary Fatally Flawed: The Pursuit of Justice in a Suspicious Election, Goddard threw his Press Secretary Hilby under the bus. "She did not have the authority" to promise poll tapes would be examined along with the thousands of ballots at the Maricopa County counting room, Goddard explained. 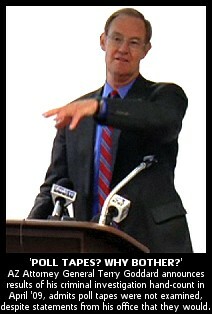 "Why would we count a poll tape?," Goddard said at the presser, as seen in the clips above. "I mean, I don't see how they are relevant to the hand-count." "The final evidence of the election are the ballots themselves," he told the assembled citizens and media, apparently oblivious to the need to confirm the possibility of ballot manipulation by the "Suspects" in his own criminal investigation. "The poll tapes are a different picture of the same process," he said, telling a reporter, to the amazement of the activists, that counting ballots is enough and that he didn't see how examining poll tapes would have any relevance to his investigation. 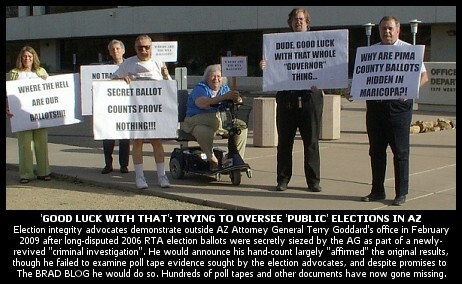 The Pima County Election Integrity Advocates continue to be skeptical about whether the chain of custody for the 2006 ballots had been truly secure by the time Goddard performed his hand-count in 2009, or if the Pima election officials --- the "Suspects" alleged by affidavit to have "fixed" the election --- might have had the means, motive and opportunity to manipulate the ballots in order to cover their tracks. In fact, as the EI folks pointed out during the hand-count --- while being ignored by Goddard --- the county had long ago purchased a "print on demand" ballot printer that can print ballots virtually identical to those used on Election Day in 2006. The actual original ballots, however, were printed by an offset printing press which, if compared under a microscope to the high-speed laser-printed "print on demand" ballots, offer tell-tale differences. Such a forensic examination of the ballots being counted by Goddard, might have revealed that original ballots had been replaced. When Goddard was asked about such a forensic examination at the 2009 post-hand-count presser, he admitted that, despite the requests, he had carried out no such examination to determine the authenticity of the ballots. "Did you do any forensic checks of the ballots to make sure they were real, period 2006 ballots?," asked Jim March of BlackBoxVoting.org at the press conference. "No," the AG tersely replied. One full year of litigation later, and the EI advocates have now finally gotten access to the poll tapes they'd sought more than a year ago, the ones which were stored in Iron Mountain. "30% of the poll tapes are missing," Risner told us during our live interview with him on the Malloy Show last week. "They simply are not in the boxes. And that's compared with the last election we had in Pima County. Some citizens asked for copies of the poll tapes and they were all there --- 100% of them were there." Risner says that prior to Goddard's having swooped in to take the ballots out of Pima last year in advance of the hand-count, they had explained to him the significance of reviewing the poll tapes. "We told the attorney general's office that if we look at the poll tape, there would be clues on it that would tell us whether they had used the machines to fraudulently program [the election]," Risner explained. "That's when he grabbed the ballots." Brakey and March's examination of those poll tapes which are not missing, show that some 50 of them do not match the numbers in the Diebold electronic databases. They say that many of the places where numbers don't jibe are the same places where their initial analysis of those databases --- the ones they received after their long court battle to get access to them more than two years ago --- are the same places where red flags were seen, such as precincts where memory cards appear to have been uploaded multiple times, for reasons still unknown. "A significant portion of missing poll tapes had corresponding anomalies in the electronic data records," documentarian J.T. Waldron told us. "It's naive to think that electronic records would be manipulated without some measure to cover tracks by either creating a new paper trail or removing the one that exists." The investigators say they are eying questionable findings from, among other places, precincts in a small township north of Tucson, called Oro Valley. When asked if he could offer any legitimate reason that the poll tapes would now be missing, Risner was blunt: "Yeah. They're possible evidence that the election was rigged." Goddard's press office responded to The BRAD BLOG's request for comment just prior to publication of this article. However, new Press Secretary Molly Edwards informed us she'd need time to look into the matter and into our detailed questions on the missing and mismatched poll tapes and yellow sheets, on whether or not the materials were there and/or accounted for when they performed their hand-count last year, and other related matters. We will update this article with whatever responses we receive from his office. When we don't bother to actually count paper ballots and rely instead on electronic scanners which may or may not be accurate, which may or may not have been manipulated, all of these questions continue to persist and the legitimacy of American democracy itself is further drawn into question. So was the election rigged? Have all these questions been those of a bunch of conspiracy theorists? Even AG Goddard himself, now set to be the state's Democratic candidate for Governor this November, had previously noted that "there wasn't a credible explanation for all of the different coincidences that seemed to have happened on this particular election." He even later conceded to the Associated Press that the paper-based optical-scan systems used in Tucson --- and in virtually every state in the nation, by the way --- "are very, very bad"? We still don't know all the answers, and the EI advocates promise more news to come as their investigation presses forward. But the fact remains that when we don't bother to actually count paper ballots and rely instead on electronic scanners which may or may not be accurate, which may or may not have been manipulated, all of these questions continue to persist and the legitimacy of American democracy itself is further drawn into question. The corporate media, however, would like to see things differently. After Goddard's hand-count last year "affirmed" the original results --- out of some 120,000 ballots reviewed, the count was off by "only" 600 votes or so, according to the AG --- local media declared the mysteries surrounding the 2006 RTA election to be at an end. All was well again in Pima County's democracy. "It's over. Done. Finished. Finis. Terminado. The state Attorney General's Office hand count of the ballots from the 2006 regional transportation authority election affirmed the initial results," the Arizona Daily Star pronounced in an unbylined April 23, 2009 editorial. "Let that be the final word," the paper pleaded, before offering a familiar, condescending refrain for Election Integrity advocates: "It's time to move on." For good measure, they even used the "c" word: "Conspiracy theorists will probably remain unconvinced that Pima County is vindicated." The Star editorial, hoping to quell concerns, uncritically quoted Goddard saying that "the chain of custody was immaculate." How "immaculate" was that chain of custody? The Election Integrity advocates have discovered that the facility at Iron Mountain wasn't as secured as they'd originally been told. "Our County Manager had instructed the County Attorney to tell Iron Mountain that no one could approach those boxes," Risner told us last week. "But in our recent poll tape case, the Iron Mountain guy said 'no one ever told us that, and our customers, the county, could always come in to these boxes'." The county "could always come in to these boxes"?! Did they? Risner doesn't yet know. "That's the next step in the lawsuit. I'm going to ask for permission to get that information from Iron Mountain," he said. "It's not the end of this story." Pima County, it should be noted, still employs the same elections personnel who ran the 2006 election. They are still operating, as Waldron says, "with impunity." 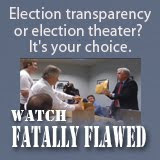 To date, neither the Arizona Daily Star, nor any of the other local papers who declared the RTA election settled and done after last year's hand-count, have bothered to report on the newly discovered 112 missing poll tapes, 102 missing yellow sheets, and 50 poll tapes that don't match the original count. • Special thanks to J.T. Waldron for his contributions to this article. • See this February 18, 2009 letter [PDF] from Risner to Goddard for much more detail on the back story.